Coffee and Chocolate are my favorite "me-time" treats and my favorite place to get my coffee is at Starbucks. Come celebrate the holiday season together with someone (and something) you love at Starbucks. 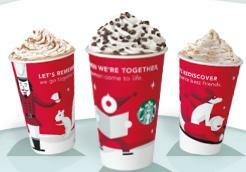 November 17th – 20th from 2–5 p.m., when you buy one holiday beverage, you’ll get a second one free. Warm up with your choice of a Peppermint Mocha or new Skinny Peppermint Mocha, Caramel Brulée Latte, Gingerbread Latte or the longest-running holiday favorite, the Eggnog Latte.